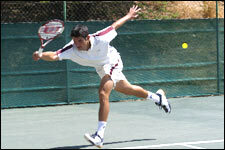 AITA Talent Series Tennis Tournament is an event that took place between 28-May-2007 and 01-Jun-2007 in Hyderabad. There are no prizes for figuring that there's more tennis happening in town than even cricket. There are, however, plenty in this AITA tourny, featuring the best of Hyderabad. The All-India Tennis Association and the Advantage Tennis Academy, with support from the A P Lawn Tennis Association, the R R District Tennis Association and the Hyderabad District Tennis Association, are organising the Talent Series Under-14 & Under-18 Tennis Tournament for boys and girls, from 28th May to 1st June, at the SAAP tennis courts in Gymkhana Grounds. Top players from 8 states of the country will be competing at this national-level tournament, which has two categories - Under-14 and Under-18 - for both boys and girls. The main draw, for both boys & girls, will consist of 20 direct acceptances based on the rankings, 8 qualifiers & 4 wild cards. There will be 32 players each in the boys and girls singles, and 32 players each in the boys and girls doubles, in both the age categories. In the Under-14 age category, K Pradeep Reddy and Ch Nidhi are the top seeds among the boys and girls respectively, and both are from Andhra Pradesh. In the Under-18 category, A M Suraj of Karnataka and S Shivani Singh of Andhra Pradesh are the top seeds in the boys and girls sections. Due to the current summer vacations, the tournament attracted more than 250 players in the qualification rounds held on 26th & 27th May, for just 32 qualification spots. The games will start at 8:00am in the morning and go on till 6:30pm. The finals of all the categories will be played on 1st June at 3:00pm. In addition to mementos being awarded to the winners and the runners-up, valuable ranking points are added to the players' profiles. The winner gets 5 points, the runner-up 4 points, the semifinalists 3 points each, the quarterfinalists 2 points each, and the first round winners 1 point each. Please contact D R C Kiron at 98851-87847 or D Chandrasekhar at 93911-70377 for further details. Be the first to comment on AITA Talent Series Tennis Tournament! Just use the simple form below. fullhyd.com has 700,000+ monthly visits. Tell Hyderabad what you feel about AITA Talent Series Tennis Tournament!